Prairie Unitarian Universalist Society is a freethinking religious community in Madison Wisconsin. We aspire to be both open-hearted and open-minded. We welcome those who enter our doors with any combination of strengths and weaknesses, beliefs and doubts. Our children receive liberal religious education as we model values in our search for truth and meaning. We are a Welcoming Congregation that opens our Sunday morning services with words similar to the following: “We welcome people of every ethnic and religious background, whatever your color, sexual orientation, or family structure.” For more on the history of our involvement in the Welcoming Congregation program, see our Archives. 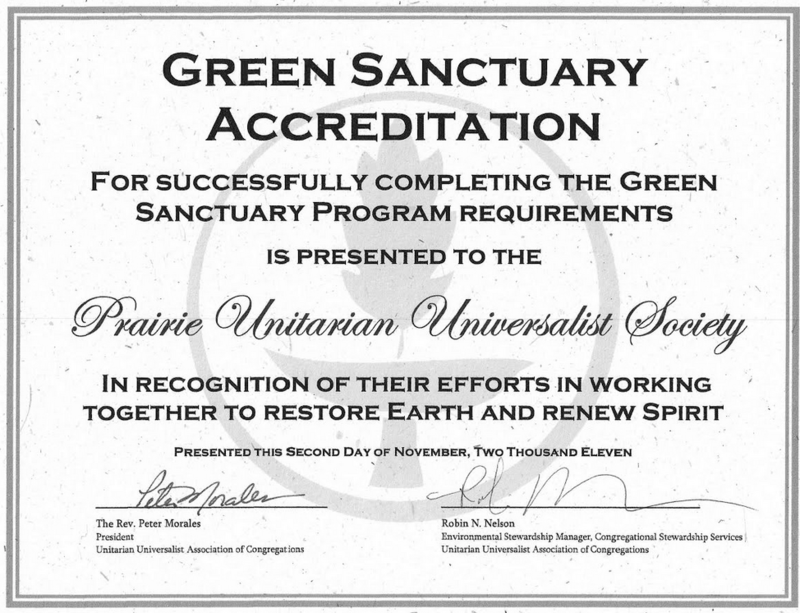 In 2011, Prairie was Accredited through UUA’s Green Sanctuary program. strengths and weaknesses, beliefs, and doubts, and who desire to learn and live by the Unitarian Universalist Principles. With our small size and wide range of ages we aspire to be like an extended family. We also seek to support one another and nurture the growth of each of our members. By sharing our joys and sorrows, we accompany one another on the journey through life. We seek to learn with and from each other in an atmosphere that respects diverse ideas, lifestyles, cultures, and wisdom traditions. Our shared values include respect for all forms of life and stewardship of the environment. Helping our youth to understand and appreciate these values is part of our mission. We seek to promote dignity, worth, and justice for people worldwide by supporting individual and collective social action. Our society is recognized and respected in the wider community. The Prairie Unitarian Universalist Society was established in 1967 as an offshoot of the First Unitarian Society of Madison, WI, in an effort to relieve overcrowding in First Unitarian’s religious education program. In 1966 First Society had purchased a portion of a “prairie” area on Madison’s far west side as a potential location for a second Unitarian Universalist congregation, and it is from that piece of land that Prairie Society takes its name. That building site, however, was never used, and it is now split between the Madison park system and the University of Wisconsin Arboretum. In September 1967, 30 adults and 78 children began meeting for religious education classes and adult services at a Catholic seminary on Madison’s far west side–the first of a series of rented locations. By-laws were drawn up in the spring of 1968 and Prairie was organized with 38 charter members — some of whom remain with the congregation even today. By September 1969 membership had grown and the meeting site was moved to the YWCA building across from the Wisconsin State Capitol. By spring of 1972 Prairie had moved again to a former church building about 1/2 mile west of Camp Randall, the UW-Madison football stadium. For two years during this period the Society had the half-time services of a ministerial student from the Meadville-Lombard Seminary in Chicago. In 1978 Prairie began renting space at the Woodland Montessori School (another former church building) on Colby Street on Madison’s near south side. Finally, in 1980, Prairie Society purchased its current quarters at 2010 Whenona Drive, Madison. In July 1988 the parish voted to remodel the meeting house. The remodeling took place in the fall of 1988 and a re-dedication ceremony was held in February 1989. For our 25th anniversary celebration in 1992, A Prairie Society Chronology was prepared by Warren Hagstrom. The results of a survey by the Program Committee provide insight into the basic viewpoints of Prairie members as of May 2009.